Here's what the above latest developments mean in terms of the 5-day NSIDC Charctic. I've zoomed to where the current action is, and I've filtered out most of the "noise" years. As usual, I've included 2016 & 2017 (natch), as well as what had been, until recently, the three years with the lowest mins - 1997, 1993 & 2011. I've added 2013, 2014 & 2015 just to show the spread from highest <> lowest annual minimums. Among the annual minimums area went up two places and is now 4th lowest. The area graph is attached. For Feb. 23rd JAXA has posted 2,167,669 km2 for SIE around Antarctica. For Feb 23, NSIDC reports a new daily record low at 2,156 Mn km2. The 5-day average dropped to 2,192 Mn km2. The latter index might go even lower tomorrow unless a significant growth is seen. I believe that todays big drop is due to that a lot of the fragmented ice in Amundsen sea went below 15%. Wipneus might know if that was the case or not. I believe that todays big drop is due to that a lot of the fragmented ice in Amundsen sea went below 15%. Wipneus might know if that was the case or not. The biggest losses are in the West Pacific Ocean region. The area losses also bring a new annual minimum, moving 2017 tot the second place where it will probably stay for quite a while. Each time one thinks the melting is over, off we go again. SST anomalies at 70 degrees and north of that still quite impressive. One waits to see if refreezing will be late and slow and then if it is but a burp or a real change down there. Patience is a virtue but sorely tested. Last days that the minimums set are in March. Extent has the latest: 6 March 1986, but the second latest extent was 27 Feb 1984, 1991 and 1997. Area has two March dates: 2006-03-04 and 1981-03-03. Before that is the pack, 17-27 February. Another daily record low and another record low 5-day average. SIE for February 24 was down to 2,145 Mn km2 while the 5-day average was down to 2,180 Mn km2. While I've hard to imagine any further extent loss the next couple of days, the 5-day average might dip down depending on the next few days SIE. I would guess that as long as it isnt clear, when the minimum will be reached this year and what the new record will be, they will wait to make any changes. Otherwise, they would have to update the record every day we see another SIE drop. Probably a lot easier to just wait a few weeks, make sure we are well past the minimum and then update the new record low number. Another daily record low, now down to 2,135 Mn km2 and a 5-day average moving down to 2,169 Mn km2... Any area changes today?
. Any area changes today? Todays sea ice map of Antarctica reveals some newly formed ice in the Ross Sea. I think this is it and that the final daily minimum will be 2,135 Mn km2. I expect a small uptick today. However, it's possible that the 5-day average might go somewhat lower than yesterdays reported 2,169 Mn km2. 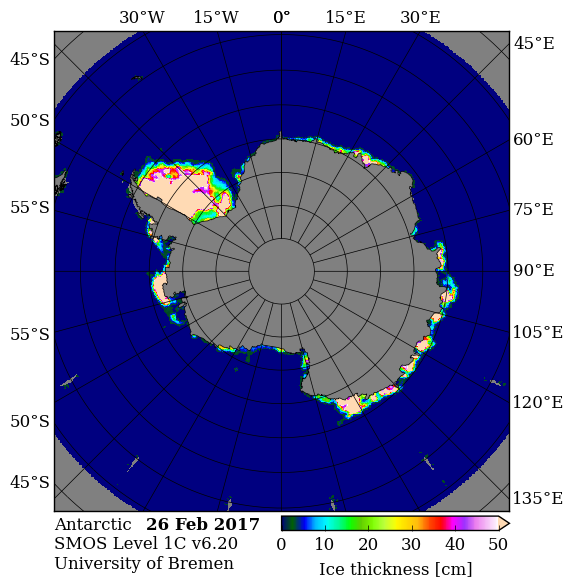 Here is the Antarctica thickness map for February 26: Courtesy to University of Bremen. Amazing. I was expecting an early minimum, following the wind-driven compaction earlier in the season. Maybe accumulated insolation is still taking its toll. For Feb. 27th JAXA has posted 2,152,483 km2 for SIE around Antarctica. Interesting TT! Todays map from UiB shows continued refreezing in Ross Sea. From Bremens graph it's a really tight race between 2017 and 1993 about the record. Should be another small uptick today from NSIDC given the newly formed ice in Ross Sea. Maybe other areas counteract these numbers by melting/compaction. Maybe other areas counteract these numbers by melting/compaction. Extent sets a new lower minimum. No Oren, the fat lady hasn't sung yet But I would be extremely surprised if we dipped below 2 Mn km2 at this time of year. Depending on the weather conditions the next few days it's possible that the 5-day average may reach its minimum March, something that's not too common. Wipneus: do you know if the extent value from Uni Bremen lower than the minimum back in 1993 and 1997 was? The data from Uni Bremen that I use is AMSR2, so only since mid July 2012. The only other (besides NSIDC) time series that I have going that far back is from IFREMER (French Research Institute for Exploitation of the Sea). It is using the ASI algorithm, so higher resolution and as different as can be. Available since 1992. But, the IFREMER data says basically the same as NSIDC: extent in 2017 is significantly lower (200k-300k) than any other year. Only 1993 area is lower than 2017 (by 200k or so). If the extent number stands, that would make 2017 second-latest by the thinnest of margins (per your sorted list in post #507 upthread). Quite a reversal from 2015, which was the fourth-earliest on record. March 1st, JAXA reporting 2,147,345 km2. Another small drop and a new record low. interesting Wipneus! Let's see if NSIDC also comes up with a new record low value today! If the NSIDC minimum (5-day avg) is occurring now in March it will only be the fifth time this happens. The earlier occurrences are: 1986 (March 6), 2003 (March 3), 1991 (March 2) and 1980 (March 1). The case from 1980 doesn't contain the value for the leap day. In 1986, the values were also given for every second day but the minimum then was so late that there can be no doubts it was absolutely the latest such and occurred in March. I hope I haven't got something wrong here! I'm beggining to wonder if these small daily losses will stretch towards the equinox, or even beyond. There may be just enough circulation of waters by the coast to inhibit freezing, and without ice cover to dampen waves much too much turbulence. 2.075 on daily NSIDC is new low as is 2147345 for JAXA. By coincidence I have just asked on stupid questions what is the accuracy of these measurements. Down to 1km2 or even 1000km2 obviously spurious accuracy ? That is a more difficult question than my simplistic we just don't know when 1986 minimum was due to reporting only every other day. The curves look quite smooth for SH compared to NH, which suggests that the uncertainty of the date of minimum is not all that high but yes 1000km2 accuracy does not seem likely. Sorry that isn't much of an answer. In a "best case scenario" we might have 1-2 days with even lower values due to intrusion of warm waters and compaction. As we already are lowest on record, I tink it would be "exciting" if we could bottom out at 1,99 Mn km2. That would require another 76K drop. But given the unusually low extent from November and onward we can be pretty sure that tremendeous amounts of heat have entered into the Southern Ocean this melting season. Even if the refreezing is imminent the damage is already done. And I won't be surprised if we are going to see some decent polar amplification by March-April around Antarctica. (...) what is the accuracy of these measurements. Down to 1km2 or even 1000km2 obviously spurious accuracy ? I would rather not call these measurements. The satellite sensor measures microwave brightness's. These are inputs to a calculation (perhaps involving other inputs) that delivers sea ice concentration on a grid with a certain cell size. Sometimes it stops there, sometimes extent is calculated (possibly with more corrections). In only a few cases area is calculated. The first step, satellite measurements, have error levels specified. The second only in a few cases. Jaxa is close to 10%, ASI (Hamburg, Bremen) may be 15%. Figures from the top of my head. I cannot remember seeing extent or even area accuracy being estimated. Full error bars would probably measured in 100,000's of sqkm. Mostly systematic (gridsize etc.) , some part random noise. The day-to-day changes (sticking to one calculation e.g. Jaxa) will be more reliable. Maybe a just a few k in case of the Antarctic minimum as crandles observed. With this in mind, I think the conclusion that the minimum can be called "rather late" is robust (with the possibility that it may later become "very late"). For year to year comparisons you need a time series that has been carefully compiled for this purpose. Only NSIDC can really be used. The IFREMER series uses the same satellite sensors as NSIDC (but other microwave bands) is available since 1992. From those I would say that lowest extent minimum since 1979 seems also robust. 1993 seems an odd year as it has a relatively very low area minimum but not by extent. Hullo ASIF Guv'nor. I actually engaged brain to read the notes on Jaxa. Confirms up to 10 % error on SIC data. BUT ! In statistics often an individual datum can have a very high error. But when enough bits of data are brought together the error of the sum of the entire data is reduced to virtualy zero. 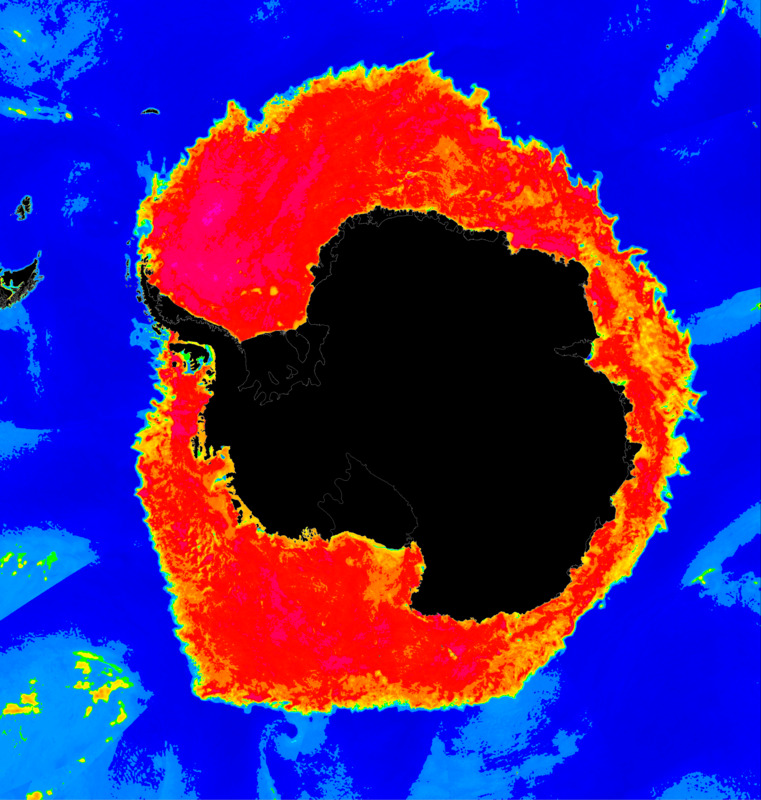 I find it hard to believe that the current Jaxa measurement of Antarctic SIE is 2147 km2 '000 +/- 10 %. As they say - I think we need to know. I find it hard to believe that the current Jaxa measurement of Antarctic SIE is 2147 km2 '000 +/- 10 %. Nobody that I know of says so. Extent calculation makes that grid cells with concentration > 25% or < 5% will have no (zero) error. In the marginal zone ( 5%<sic<25%) random errors will cancel out, but systematic (too low or too high values ) won't. Especially in the Arctic false coastal ice is surprisingly large ( my coastal correction today in UH calculation is 262k extent and 157k area). This very valid question is at least partially addressed by the NSIDC in their FAQ section. "We estimate error based on accepted knowledge of the sensor capabilities and analysis of the amount of “noise,” or daily variations not explained by changes in weather variables. For average relative error, or error relative to other years, the error is approximately 20,000 to 30,000 square kilometers (7,700 to 11,600 square miles), a small fraction of the total existing sea ice. For average absolute error, or the amount of ice that the sensor measures compared to actual ice on the ground, the error is approximately 50 thousand to 1 million square kilometers (19,300 to 386,100 square miles), varying over the year. During summer melt and freeze-up in the fall, the extent may be underestimated by 1 million square miles; during mid and late winter before melt starts, the error will be on the low end of the estimates. It is important to note that while the magnitude of the error varies through the year, it is consistent year to year. This gives scientists high confidence in interannual trends at a given time of year. The absolute error values may seem high, but it is important to note that each year has roughly the same absolute error value, so the decline over the long term remains clear. 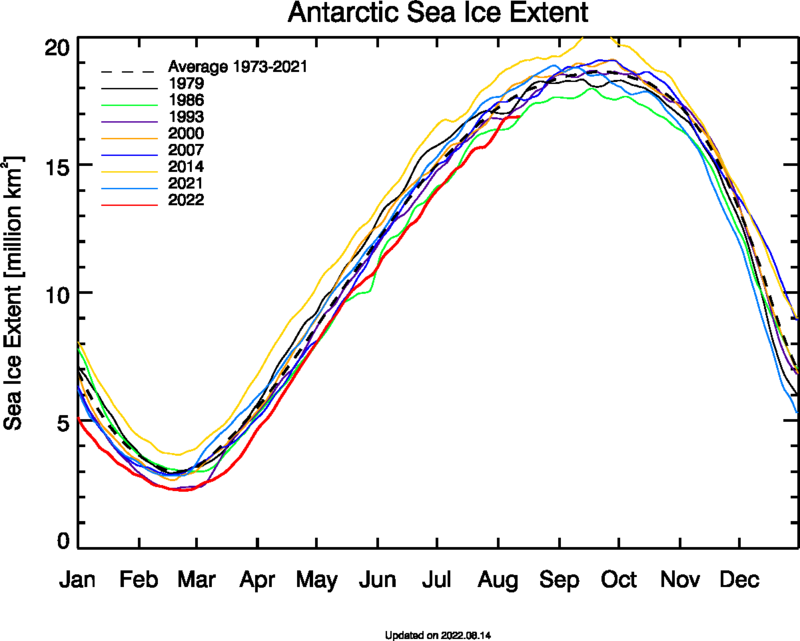 NSIDC has high confidence in sea ice trend statistics and the comparison of sea ice extent between years." So it is the trend that matters as if there is error it is consistent. It is just as well the trolls are pretty dumb. The potential for misinformation is high. NSIDC show increases, but slow compared with most other years. The drop in area means a new minimum. The date, 4th March, is the latest on record, shared with 2006. Thanks for providing details on both series during this time. Interesting to note there are day-to-day differences by region, though the regional deltas were more in agreement on 03-01 when extent hit its minimum.